With these words in mind the Dutch religious sculptor and printmaker Hein Koreman designed an innovative and contemporary Holy Heart sculpture in 1955. Holy Heart devotion dates back to the late medieval mystics, while becoming a collective movement in the 17th century. This form of devotion was officially recognized by the Catholic church in 1756. In the increasingly modern society of the late 19th and early 20th centuries the veneration received new impulses by the renewed attention accorded to it by several popes. Pope Pius IX instituted the Holy Heart Feast and Pope Leo XIII called the Holy Heart of Jesus ‘a fortune bringing and divine sign,’ of significance to the modern world. In many churches Holy Heart sculptures were installed. They were also given a prominent place in quite a few Catholic living rooms. The artistic representation of the Holy Heart, however, was problematic. Devotional images of this type were usually portrayed with an open chest with a blood-red heart lighted by a flame. The heart symbolized Christ’s life and suffering and the flame his love and charity. These images, which also influenced sculptures of this subject, were rarely experienced as art, but rather as ‘kitsch’. Not only for Holy Heart sculpture it had become an urgent question whether to stick to traditional forms or to search for new ways of portrayal. In various Catholic circles in the Netherlands the artistic design of the interior and architecture of churches in general had become a subject of (sometimes heated) debate. Hein Koreman, who preferred sober and stylized work, was known to give much attention to pose and gesture. He also became fascinated by the problems surrounding the depiction of the Holy Heart. When in 1955 a prize was put up by the missionaries of the Holy Heart in Tilburg for their 100th anniversary, Koreman decided to take part. He designed an innovative sculpture. A fully human Christ looks serenely at us with his arms open wide. Centrally and soberly the Holy Heart has been rendered in relief as a sign of God’s indescribable love. The sculpture was awarded the first prize and laudatory reviews followed. Mention was made of the generally felt artistic impotence of portraying the symbol of the Holy Heart in a form that was aesthetically sound. There were six bronze copies of the winning design. According to Koreman they were placed ‘here and there’ in churches and monasteries. Thanks to this winning work church commissions increased for Koreman. The model in bronze shown here, ca. 35 cm high, stayed in the possession of the artist. In an interview Koreman related to me that as a point of departure he chose ‘not the illustrative, nor the narrative, but pictorial qualities and measurements in relation to each other.’ According to him this means that the sculptor is aware that the underlying system of measurements is the carrier of his emotions. ‘I do not see the Holy Heart Sculpture in red-white-and-blue, but in masses, measurements, volumes and the abstract working of these.’ Thus he arrived at a sculpture with contrasts: small feet and a large robe. He wanted the work to communicate what he had learned in his youth with respect to the Holy Heart devotion: ‘Come to me, all you that are weary and are carrying heavy burdens, and I will give you rest’ (Matthew 11:28). Artistically Koreman worked to find his own way. He experienced freedom in restraint and did not feel hampered by ecclesiastical conventions. Several of his sculptures can be found in public spaces in Dutch cities like Breda, Tilburg and Hilversum. He is well known for his bronze sculpture The Flight (1954) of a mother with a resisting child, a war monument in Breda that still attracts many visitors. In the 1960’s Koreman’s work became more and more abstract in an effort to capture the essence of the subjects at hand. Coming from a Catholic milieu, faith played an inextricable role in his work. Aware of the fast modernization of the visual arts and architecture in the 1950’s and 1960’s, he set his course by following his personal compass and most of all his own heart. 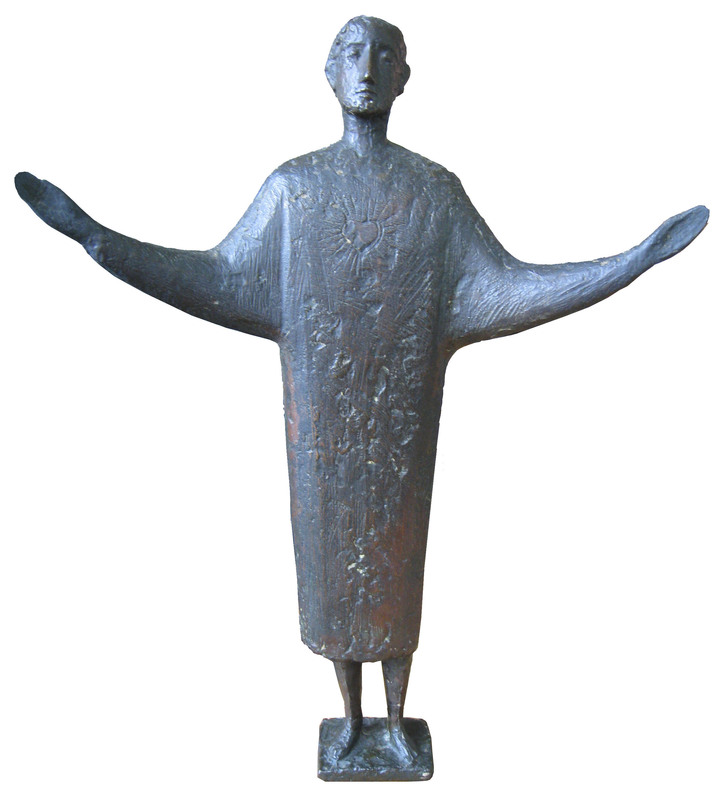 Hein Koreman: Holy Heart Sculpture, 1955, bronze, 35 cm. Hein Koreman (1921- 2012) attended the Art Academy in Tilburg and the Rijksacademie in Amsterdam. After1945 he received many commissions from churches. Lisette Almering-Strik (1955), Master of Arts, studied Cultural Sciences at the Open University in the Netherlands. Since January 2012 she is working on her PhD, researching the 20th-century Catholic art debate.